Struggling adolescent readers can benefit from The Third Quest, a new reading intervention by Marilyn Sprick and Ann Watanabe. The Third Quest leverages intrigue and mystery to engage students as they take a trip through ancient history. Research-based lessons include word study with an emphasis on multisyllabic word reading, focus on fluency improvement, explicit instruction in sophisticated vocabulary, comprehension strategies, social studies and science content knowledge, and study skills. High growth is a goal for all students we serve. Despite this vision, we often inadvertently use instructional practices that favor one group of students over others. For example, one common practice is to call on volunteers rather than call on students randomly. High-performing, assertive students proficient in English are most likely to volunteer, increasing their amount of practice and subsequent learning. This is just one of many instructional practices that Dr. Archer sheds light on during this webinar. Jessica Sprick explores problem-solving processes for behavioral issues, a follow-up to November’s Closing the Gaps webinar. Standard decision-making rules will help you consistently match Tier 2 and Tier 3 interventions to the needs of each individual student and ensure that your behavior supports follow best evidence-based practices. Dr. Bill Jenson, author of The Tough Kid books and materials, introduces the newly updated Parenting Through Tough Kid Moments book and discusses how schools can incorporate the book into new and existing parent groups. Third Quest author Marilyn Sprick discusses this new and comprehensive intervention for struggling readers. 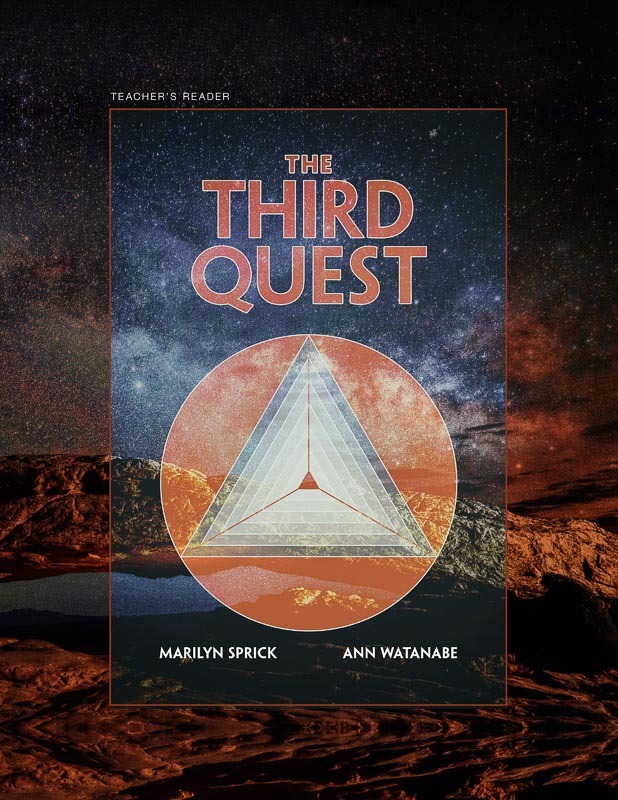 The Third Quest, by Marilyn Sprick and Ann Watanabe, leverages intrigue and mystery to engage students as they take a trip through ancient history. Research-based lessons include word study with an emphasis on multisyllabic word reading, focus on fluency improvement, explicit instruction in sophisticated vocabulary, comprehension strategies, social studies and science content knowledge, and study skills. Suitable for grades 5 through adult. School improvement is a continuous process and requires ongoing attention. For many reasons—an ever-changing student body, inadequate record keeping, new leadership, and so on—CHAMPS and Foundations implementations may stall or derail. Randy Sprick explains how to assess the health of your implementation and what to do to recharge the initiative, if needed. Jessica Sprick discusses how to develop a continuum of evidence-based behavior supports. In many districts, Tier 2 and Tier 3 supports are idiosyncratic from one building to the next, and even in the same building from year to year depending on the personnel in the school at the time. Based on this webinar, your school or district can adopt, modify, or develop a similar protocol to ensure best practices (evidence based) in providing Tier 2 and Tier 3 behavior supports. Author Dr. Jason Burrow-Sánchez explains how the ADAPT small-group intervention can help middle and high school students who are at risk for substance use, aggression, truancy, poor school performance, and depressive moods. ADAPT teaches students the fundamental skills of problem solving and decision making then provides opportunity to generalize those skills to common issues adolescents experience such as negative mood, anger management, communication, social support, and understanding the negative effects of drugs. Two years of field-testing in a high school setting demonstrated that students receiving the program had decreases in depressive symptoms, increases in self-esteem, and good rates of abstinence for substance use compared to those who did not receive the program. This webinar focuses on evidence-based practices for teaching children on the autism spectrum effective social skills that enable them to make and keep friends. Dr. William R. Jenson will review research on the challenges and failures of traditional methods of teaching social skills and use examples from the Superheroes Social Skills program to illustrate effective strategies such as video modeling, self-management, fast hands animation, and “sticky” generalization interventions. Explicit Instruction has proven effectiveness for teaching a range of facts, strategies, and concepts. In this webinar, Dr. Archer introduces, models, and discusses instructional procedures for teaching facts (what we know), strategies (how to do something), and concepts (what is something) using examples across domains and grade levels. Learn about two practical, evidence-based strategies for dealing with tough problems. The Tough Kid On-Task in a Box is for kids who lack concentration, are unfocused, or are focused on anything but instruction. The Tough Kid Electronic Home Notes brings school-to-home collaboration into the digital age through the use of the Google platform. Send a custom home note via email and view progress-monitoring charts automatically. Bullying is a pervasive problem that negatively affects all students, including those who bully, those who are targeted, and bystanders. Learn about new resources from Pacific Northwest Publishing that guide you through a multitiered approach that encompasses universal procedures, strategies for intervening with students who bully, and strategies for intervening with students who are targeted. Learn how to use the perceptions of staff, students, and parents to guide your school improvement process. Results from these surveys can assist in setting meaningful and measurable goals to improve safety, respect, inclusiveness for all the school’s stakeholders. Find out if there are differences between staff and student perceptions about fairness, availability for help, consistency of staff, clarity of expectations, and staff kindness. Learn if students think the work they do in school is important and if there are any significant barriers to learning. These are just a fraction of the things you can learn about your school that will allow you to celebrate success and identify concerns or gaps that may need attention. Join Marilyn Sprick of the FIRST STEP Next authoring team to learn more about FIRST STEP Next, a home and school intervention for young children (PreK-2) who exhibit challenging classroom behaviors such as defiance, conflicts with peers, and disruptive behaviors. Intervention during the first three years of schooling can avert negative consequences for these students later on. The authors of Picture Perfect: Video Self-Modeling for Behavior Change discuss this powerful intervention. Video Self-Modeling uses carefully planned and edited videos that allow students to view themselves performing a task, skill, or behavior at mastery. Research shows this intervention can help students learn classroom routines and transitions, appropriate replacement behaviors for aggression and tantrums, language pragmatics and more. Join Randy Sprick as he introduces Leadership in Behavior Support, a substantial update of the <em>Administrator’s Desk Reference</em>. Building administrators guide and shape school culture and climate to create and sustain a safe and productive school environment that fosters growth, encourages responsible behavior, and enables student success. Leadership in Behavior Support guides administrators through processes such as working with a behavior leadership team, establishing a 3-level discipline system, and developing guiding principles such as Guidelines for Success. What motivates students to miss school and how do the families fit into the picture? Learn how to analyze attendance data in meaningful ways, the common causes of chronic absenteeism and truancy, and what your staff can do to curb the problem in your school or district. Jessica is co-author of Functional Behavior Assessment of Absenteeism & Truancy, Absenteeism and Truancy: Interventions and Universal Procedures, and an Educational Leadership article on how Barnes Elementary in Kelso, WA, identified and addressed its problem with chronic absenteeism. The Connections Web-based monitoring and feedback system promotes communication, goal setting, and constructive change at school and at home. This Tier 2 and 3 behavioral intervention is the only check-in system with scannable daily monitoring cards. Connections automatically produces reports for each student and gives daily feedback on student choices.​ Presented by program author Mickey Garrison. We often provide excellent initial lessons on content, only to be disappointed when students don’t remember, use, transfer, or retain the information. In this webinar, you will learn how effective initial instruction and well-designed practice can change that scenario. Learn to use research-validated procedures: Deliberate Practice, Retrieval Practice, Spaced Practice, Varied Practice, and Mixed Practice. Join Dr. Bill Jenson, author of The Tough Kid books and materials for an examination of the evidence-based practices of teaching children on the autism spectrum effective social skills that enable them to make and keep friends. This webinar emphasizes both the effective teaching of social skills and the use of those skills by children on the autism spectrum to make friends and socially interact in generalization settings. Join Dr. Bill Jenson, author of The Tough Kid books and materials, for a one-hour introduction to The Tough Kid series. Learn practical, evidence-based strategies for dealing effectively with tough problems like aggression, noncompliance, lack of motivation, and poor academic performance. The Tough Kid Series addresses issues that arise for new and veteran teachers, parents, and the kids themselves. Join Jessica Sprick, coauthor of Functional Behavior Assessment of Absenteeism & Truancy and Absenteeism and Truancy: Interventions and Universal Procedures, for a one-hour introduction to the program. Learn how to analyze attendance data in meaningful ways, the common causes of chronic absenteeism and truancy, and what your staff can do to curb the problem in your school or district. Foundations schools report improved school climate and reductions in referrals, suspensions and expulsions. In this introduction to the Foundations program, Dr. Randy Sprick explains how your team can design a proactive and positive schoolwide discipline plan. Join Drs. Hill Walker, Herb Severson, and Randy Sprick for a one-hour introduction to universal screening and SSBD. Learn how SSBD can help you assess all students for externalizing and internalizing behavior quickly and reliably. Join our mailing list to be notified about future webinars.